KAU Merit Scholarship for B.V.Sc & A.H.
2. Second rank holder for B.V.Sc & A.H.
3. ICAR-Junior Research Fellowship for M.V.Sc. 4. 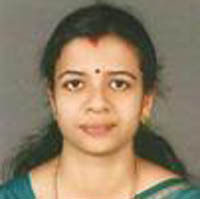 Gold medal & G. Ramanujari memorial Prize from TANUVAS for the best M.V.Sc Student in Parasitology. 5. Gold medal & Rao sahib M.Ananta Narayan Rao memorial Prize from TANUVAS for the best M.V.Sc student in Parasitology. Orientation training from 24.10.07 to 20.11.07 at Academic Staff College, Calicut University, Kerala. Training programme on “Winning Research Proposals in Agricultural Research “from 14.10.08 to 20.10.08 under NAIP at NAARM (National Academy of Agricultural Research Management), Hyderabad. In Silico genome and proteome Analysis” conducted by Department of Bioinformatics and ARIS cell at Madras Veterinary College,Chennai July 1-5,2013. Hands on Training on “Basic Molecular Biology Techniques & Introduction to Bioinformatics” 17.07.2017-26.07.2017 at School of Applied Animal Production and Biotechnology, CVAS,Mannuthy. Bindu Lakshmanan, Jain Jose,K, Arun George, N.P Usha ans K Devada. 2018. Molecular detection of Hepatozoon canis in dogs from Kerala. Journal of Parasitic Diseases.httpps://doi.org/10.1007/s12639-018-0998-7(Published online 23 April, 2018). Jose Jain, Bindu Lakshmanan, Hitaishi V Nagaraj, Jose E Praveena, K. Syamala, and TV Aravindakshan.2018. Detection of Babesia canis vogeli, Babesia gibsoni and Ehrlichia canis by multiplex PCR in naturally infected dogs. Veterinarski Arhiv. 88(2): 215-224. Kollannur Jose Jain, Bindu Lakshmanan, K. Syamala, Praveena, JE and TV Aravindakshan.2017. High prevalence of small Babesia specis in canines of Kerala,South India. Veterinary World 10(11): 1319-1323. (NAAS: 5.71). Sneha Augustine, Lucy Sabu, Bindu Lakshmanan. 2017. Molecular identification of Babesia spp. in naturally infected dogs of Kerala, South India. Journal of Parasitic Diseases. 41: 451 (DOI 10.1007/s12639-016-0827-9 NAAS 4.65). Bindu Lakshmanan,K.Devada,Siju Joseph and IS Sajitha. 2016. Immunoblot profile of soluble egg antigens of Schistosoma spindale. Journal of Indian Veterinary Association. 14(1):63-66. Bindu Lakshmanan,K.Devada,Siju Joseph and R Radhika.2015.Immunoblot Analysis of Schistosoma spindale excretory-secretory antigens with sera from naturally infected bovines. Journal of Applied Animal Research 44(1) .210-214. (Impact factor NAAS: 6.12, ISI 0.503). Divya SP, Bindu Lakshmanan and Siju Joseph. 2013. Efficacy of counterimmunoelectrophoresis in diagnosis of Schistosoma spindale infection in cattle. Indian Veterinary Journal.90:20-22. Nair,A.S, Ravindran R,Lakshmanan,B, Sreekumar,C Kumar,S.S, Remya Raju Tresamol,P.V, Vimalkumar,M.B and Saseendranath,M.R. 2013.Bovine carriers of Anaplasma marginale and Anaplasma bovis in South India.Tropical Biomedicine 30(1):105-112. Bindu Lakshmanan, Abdu Rauoof, Muhammed Fawaz and H. Subramanian.2011.Abattoir survey of Schistosoma spindale infection in Thrissur. Journal of Veterinary and Animal Sciences. 42(1 & 2):53-54. Archana. S. Nair, Reghu Ravindran, Bindu Lakshmanan, Swaroop. S. Kumar, C. Sreekumar,P.V. Tresamol, H. Subramanian and M.R. Saseendranath.2011. PCR RFLP for detection of Anaplasma marginale in carrier bovines. Indian Veterinary Journal. 88(7):23-24. Bindu Lakshmanan, Reghu Ravindran,Vasudevan,V.N and Devada,K.2011 Hepatic Coccidiosis in Rabbits in Kerala. Journal of Indian Veterinary Association, 9 (2):56-57. Nair,A.S, Ravindran R, Lakshmanan,B, Kumar,S.S, Tresamol,P.V, Saseendranath,M.R, Senthilvel,K, Rao,J.R, Tewari,A.K and Ghosh S.2011.Haemoprotozoa of cattle in Northern Kerala,India. Tropical Biomedicine 28(1):68-75. R.Ravindran, B.Lakshmanan, C.Ravishankar and H.Subramanian. 2008. Prevalence of Linguatula serrata in domestic ruminants in South India. Southeast Asian Journal Tropical Medicine and Public Health. 39(5):808-812. Bindu Lakshmanan, Lalitha John, Gomathinayagam,S and Dhinkarraj,G. 2007.Early Diagnosis of canine ehrichiosisis by Hot start PCR . Journal of Applied Animal Research. 31:11-12 . P.Ramesh Kumar, Reghu Ravindran, Bindu Lakshmanan, P.Senthamilselvan H.Subramanian, T.Sreekumaran. 2007.Pathology of nodular tapeworm in backyard poultry. Journal of Parasitic Diseases. 31(1):54-55. Reghu Ravindran, Bindu Lakshmanan, Anoop, S., Rajeev, T.S. and Dinesh, C.N. 2006. Parasitic infection in captive lions (Panthera leo) at Wayanad. Zoo’s Print Journal.21: 2230. Bindu Lakshmanan, Lalitha John, Gomathinayagam,S and Dhinkarraj,G. 2005. Demonstration of Ehrlichial inclusions using Acridine Orange stain. Journal of Veterinary and Animal Sciences. 36:157-158.